♦ Clean your copper bottom pots with a paste of lemon juice and salt. Scrub with a pad and rinse. ♦ Clean your plastic or wood cutting board with lemon and salt. Also removes stains. ♦ Add the peels to your garbage disposal and turn on to refresh. 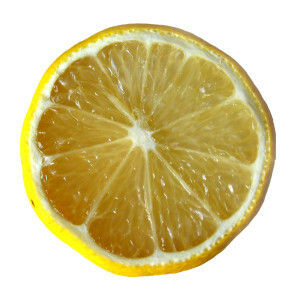 ♦ Remove scratches on furniture with equal parts of lemon juice and salad oil. ♦ Remove onion, garlic, or fish smell from your hands with a little lemon juice.